It can be difficult to describe how the perfect Christmas getaway destination looks and feels. For most people, it all depends on whether it is cosy and welcoming and the addition of snow is always a welcome bonus! Christmas is, for many, the most wonderful time of the year and so spending the festive period in a place that is a little different will always make this time feel much more special. Whether you’re heading away on a festive break with your significant other or fancy some sightseeing with your best friends, there are plenty of cities you can visit to make the most of your free time this Christmas. Here are 5 of the best festive city breaks you can go on this Christmas. If you fancy a break away from a Christmas dominated by gifts and spending money, the Reykjavik in Iceland is a destination that escapes all of the usual everyday stresses over the festive season. Almost every hotel is fully booked leading up to Christmas and New Year, and it is no wonder why. With one of the most dramatic and breathtaking landscapes in the world, Christmas in Iceland is a world away from the hustle and bustle of most European cities. The Nordic country focuses on its own Christmas traditions, particularly the thirteen Yule Lads who take Santa’s place during the holidays to prank the locals. Christmas is a big deal for Icelanders, who celebrate over a period of 26 days. On Christmas Eve, a huge procession singing carols is led from the Hallgrimskirkja church through the main high street. Christmas Day and Boxing Day are generally quiet days, with most shops and restaurants shut, making it the perfect chance to unwind and relax. Spending time in Bruges in the month of December is almost like stepping straight into the front of a Christmas card. Located in the Flemish region of Belgium, the medieval city of Bruges glows with fairy lights throughout Christmas. With plenty of Christmas market stalls to explore, beautiful gothic churches to admire and pretty decorations to compliment the buildings, time spent in Bruges over Christmas is sure to leave you feeling warm and fuzzy. No matter if you prefer to visit the square for a spot of ice skating and a warm mug of fresh mulled wine or spend time exploring the quaint buildings which line each and every street, there is an abundance of festive things to do. Much like Iceland, Oslo is a whole other world away from the typical Christmas stress we’re used to. There are several markets dotted around the city, where you can find numerous Christmas treats, including gingerbread and handmade gifts. As well as market stalls, there is also a Ferris wheel, ice-skating rink and even the chance to meet Santa. Christmas in Oslo isn’t just about carol-singing and keeping people happy. There are many other concerts and events in the city. Check out the local bars for some fun and quirky entertainment on the nights in the run up to Christmas. Once Christmas Day is over, the Norwegians keep on celebrating. The gap between Christmas and New Year is known as Romjulen and whilst most of the shops are closed, there are still plenty of fun things to do in the city. Spend some time relaxing at a sauna followed by some heart food or take part in some fun local traditions. Christmas truly is the most magical time of the year in Manchester and it is the perfect location if you’re looking at going on a festive city-break. There are plenty of shopping opportunities, with over 300 Christmas market stalls to explore and high street and independent stores to browse, too. Finding what’s on in Manchester this Christmas couldn’t be easier as there is no shortage of activities, no matter the time of year. As well as the hugely popular Christmas markets, there is also ice-skating and outdoor cinemas showing Christmas films at the weekend too. If you prefer to keep warm indoors, then why not visit one of the many pantomimes or shows in the city or head to one of the city-centre hotels for a festive afternoon tea spread. Whilst many cities offer just one or two Christmas markets, Amsterdam is home to 26. Some of the best market stalls can be found at Leidseplein, where you can try the region’s most-loved snack – Oliebollen (Dutch doughnuts). Other stalls have some great must-try snacks, including waffles and sausages or buy some last-minute Christmas gifts. If, after all the doughnuts and waffles, you fancy burning off a few calories, head to the ice rink in front of the Rijksmuseum. Here, you’ll also find the Ice Village, which is a wonderland full of festive music, gifts and steaming mulled wine. 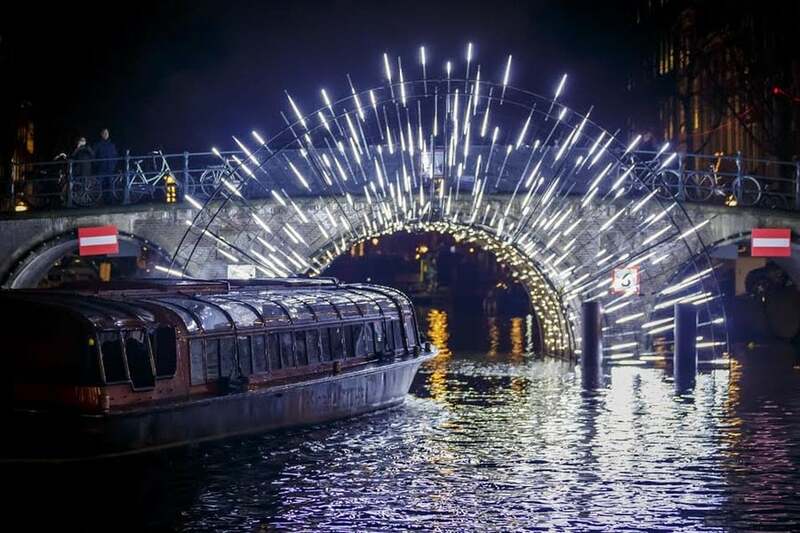 Don’t forget to have a stroll along the canals and make the most of the Amsterdam Light Festival, which is an annual light festival where the famous canals are lit up with unique installations.